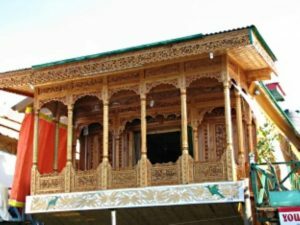 Houseboat Young Bombay, Srinagar is replete with modern amenities and is beautifully decorated with wooden pieces of art. Perfectly suited for the globe hoppers visiting the heaven on the earth, this impressive resort offers authentic hospitality and efficient services. It provides guests with luxury and a lifetime experience with its contemporary designs and gratifying ambience. The guests can avail its exotic culinary dishes served in its gracious restaurant and spacious bedrooms that are fully furnished and are connected to the lakeside terrace. Hari Parbat Fort (4kms), Royal Springs Golf Course (4kms), Botanical Garden (4kms), Shalimar Bagh (11kms), Kashmir Mahal (8kms), Sone Lank (8kms), Char Chinar (5kms), Kathi Darwaza (4kms) and Kasmir Government Arts Emporium (3kms). The facilities offered at the hotel include free breakfast, free high speed internet connectivity and room services. The hotel houses a multi cuisine gracious restaurant that serves the local dishes and free Kahwa, the traditional Kashmiri tea. The meticulously designed Standard Rooms are quite spacious with textured ceilings and an attractive appeal. The rooms are equipped with comfy king size beds with soft mattresses, lakeside terrace, supply of electricity, mosquito nets in the window, fans and well designed bathrooms.